Sweden is one of the few countries which offers official language courses for foreign people living here temporarily or definitively. The Swedish for Immigrants program, also known as SFI, is free for those who hold “personnumers” and aimed to prepare students to become fluent in Swedish in 2 years. However, those who will not study in Sweden for more than 1 year and 1 day, unfortunately, will not be able to apply to SFI, as it is not possible to apply for the residency number for a shorter period. But, this fact does not mean that you will not be able to learn Swedish while you study here for only one year since there are many strategies to learn the language by yourself or with the support of a course. If you prefer to learn Swedish by yourself, make sure you check this amazing post with all the info and tips you need to know. 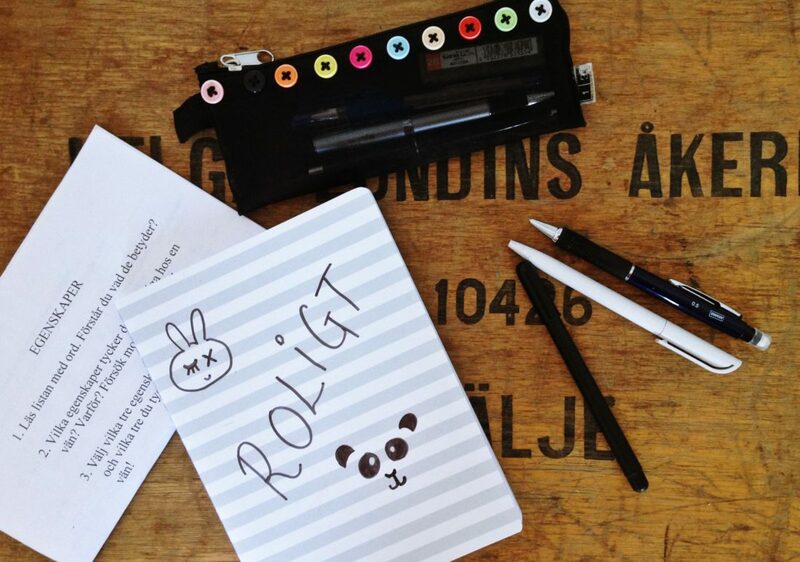 On the other hand, if you, like me, prefer to sign up for a language course, this post will be very helpful and it will feature some practical information about the Swedish Course offered by Folkuniversitetet and my personal perspectives of my studies there. 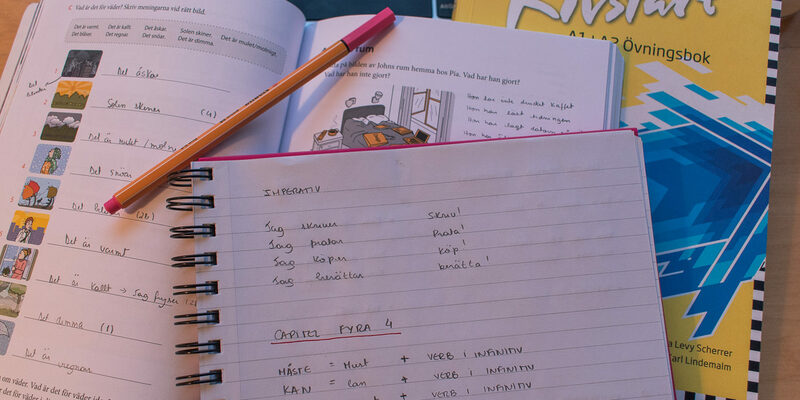 My initial plan was to study Swedish by myself, and despite I am a very self-disciplined person, I really could not keep up with a good study flow, as my schedule at school was very intense and I ended up prioritizing my Master’s activities while at home. So, I decided that joining a course would be the best option, as this way I would have the “obligation” of organizing my days in a way that I would have to be present and study Swedish for at least 4 and a half hours per week. According to my research, Folkuniversitetet was considered the best option for those who cannot apply to SFI and now that I have finished the first module with them I can tell it is indeed a very good course and it was worth the (not so cheap) fee. Folkuniversitetet is one of the best private schools in Sweden and it offers many different courses, from various languages to acting and photographing for example. It is recognized for its excellence in teaching and has high standards on its education systems. There are many Folkuniversitetet courses across Sweden and you can check the whole list clicking here. Big University cities such as Stockholm, Uppsala, Lund, and Gothenburg have guaranteed A1 courses starting in the beginning of the academic year and offered during the night, especially for international students. That seemed such a good option for me, as I was able to manage my schedule at school in a way that twice a week I could participate in the Swedish classes at night. Thus, I joined the course and I could not be more glad I did so because the course is really effective and for me, it was indeed much better than trying to study at home. Folkuniversitetet offers a complete Swedish program and it is designed for those with no knowledge at all to become proficient in the language after 5 courses. The program starts with the A1 course and it is followed by A2, B1, B1+, and B2. They offer those courses in two different versions, the regular that usually lasts for 2 and a half months with 2 meeting of 2.15 hours a week and intensive courses with 4 meetings a week of 4 hours each. The intensive course is usually offered during the morning or afternoon and the regular course is offered during the night, as it is the main choice of Masters and Exchange students. The book used by the course is Rivstart and the classes are very complete, with listening, writing, reading and speaking in each session. My course was entirely taught in Swedish, which in many circumstances made me and the others very confused, even though in the end we all agreed it was clearly an effective strategy to force us to understand and get more familiar with the language. Nevertheless, I heard that some other teachers of A1 and A2 courses apply a different methodology and provide explanations in English instead of Swedish. The classes are composed of 10 to 15 students and the number of lectures depends on the number of people, so if you get a bigger group expect to have extra classes in the end. Also, you should expect to have a great amount of homework in between classes and to follow it with attention, as it is one of the best ways to consolidate the knowledge. In my experience, the A1 Swedish Course offered by Folkuniversitetet was very effective and I acquired a good understanding of the language in only 2 months and a half. I must be honest and let you know that my schedule at school is extremely intense, therefore, I could not dedicate myself as much as I should. 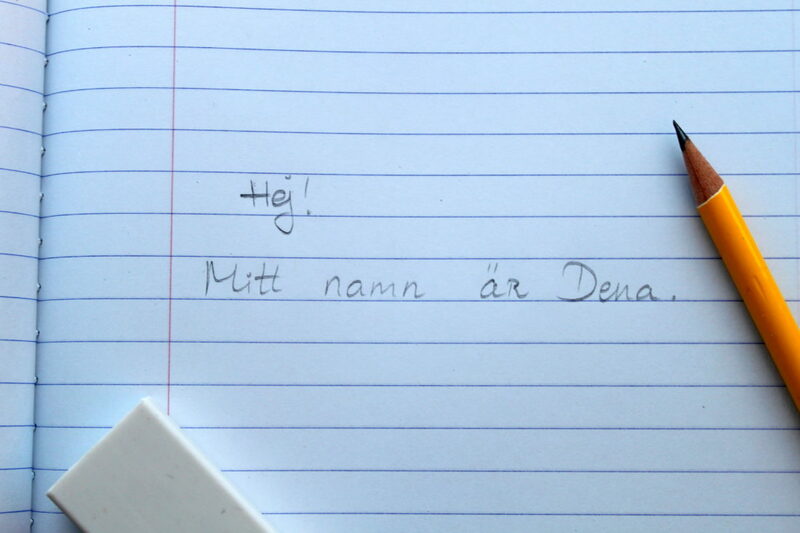 So, I could notice a tremendous difference in my development compared to some colleagues that actually dedicated quality time to the studies and practice of the Swedish language outside the classroom. Just like in any other learning process, your willingness to take over the responsibility will determine the outcome of the course, but the tools offered by Folkuniversitetet are extremely relevant. 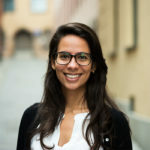 I will continue the program in Folkuniversitetet and update this post in case I have a different perception in the next months, but for now I would totally recommend it for those, who like me, are planning to pursue a 1-year Master’s program in Sweden and are interested in learning the language. Do you have anyinformation about 60 cridet 1 year accademic study in folk? Can i get 12 months and1 day permit with 11 months cours?? I really don’t know about the visa permit for this course, so I advise you to get in touch with the Immigration Service, who will for sure provide you the best answer!